Dr. Chiew was a presenter and facilitator at the Women’s Affective Science Institute at CU-Boulder! Having the opportunity to discuss research, career trajectory, and issues of diversity and inclusion with this fantastic group of women was a lot of fun. Lyneé Alves and Avery Gholston presented their research at the Annual Meeting of the Rocky Mountain Psychological Association! Lyneé Alves presented her research at the Annual Meeting of the Society for Affective Science in Boston! 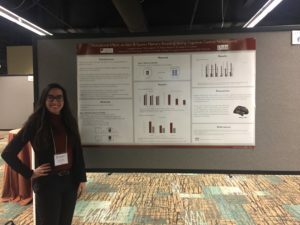 Check out her poster, “Motivational effects on item and source memory encoding during cognitive control performance”, in PDF here. Avery Gholston and Cory Vandenberg were awarded Partners in Scholarship (PINS) awards from the DU Undergraduate Research Center to support their research in the MAC Lab! Congratulations to Avery and Cory!! We are delighted to welcome incoming graduate student Lyneé Alves and new lab manager Kevin Summers to the lab! Dr. Chiew was a presenting speaker in a symposium on Motivated Memory at the Annual Meeting of the American Psychological Association. We are incredibly excited that our 3-year National Institute of Mental Health AREA grant has been funded! This grant will support our lab’s research into the neurobiological mechanisms by which motivation can influence cognitive control and memory using fMRI and TMS methods, in collaboration with colleagues at DU, University of Colorado, and Duke University. Students interested in potential graduate or undergraduate opportunities related to this line of research should email Dr. Chiew. 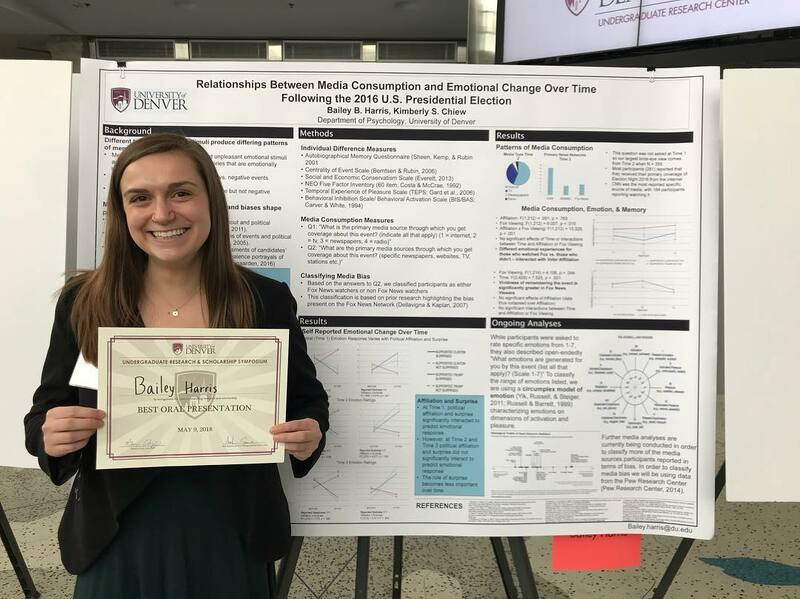 Bailey Harris presented her research in the DU Undergraduate Research & Scholarship Symposium and won Best Oral Presentation! Congratulations Bailey!! Dr. Chiew was a presenting speaker in a workshop entitled “Motivation and Learning: What is Provocative And/Or Novel?” at the Annual Meeting of the American Educational Research Association. Dr. Chiew traveled to North Carolina and gave a talk at the Department of Psychology at Wake Forest University. Dr. Chiew traveled to Wyoming and gave a talk in the Neuroscience Seminar Series at University of Wyoming. Dr. Chiew traveled (up the road) to Boulder and gave a talk in the Institute of Cognitive Science Seminar series at University of Colorado-Boulder. Dr. Chiew was a presenting speaker in a symposium on Autobiographical Memory at the Annual Meeting of the Psychonomic Society. The MAC Lab opens its doors in DU’s Psychology Department!